Designed for the air intake and extract systems of critical applications where high efficiency filtration is necessary. The multiwedge system provides a much larger media area for higher airflow capacity than standard deep pleat HEPA filters.These filters are subjected to full quality assurance procedures and each filter is individually leak tested, certified and numbered for tracking. 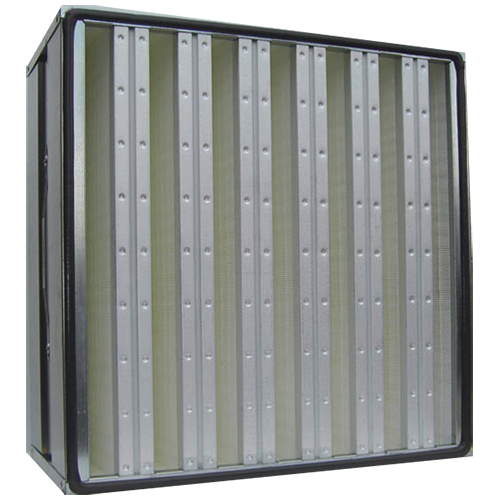 Manufactured from non fibre-shedding micro-fibre glass paper the filter packs are mini pleated with the pleats separated by a continuous thermoplastic cord.The filter packs are then sealed with Polyurethane sealant into a galvanised steel or MDF case. They are then fitted with gaskets as required. Multiwedge HEPA's are available with efficiencies between H10 to H14, in a range of standard cases with nominal airflow rates up to 4000m3/he.